If you suffer from bowel pains, or have suffered from constipation, you will be amazed of this unique and uncommon technique to reduce or eliminate them. Some investigators in London discovered that most peppers cause a burning sensation when we eat them and stimulate certain receptors in the gut or mouth. Meaning that eating more chillie peppers in our diet can naturally help us stimulate our metabolism like a tic-tac clock. The secret? Capsaicin! Chili peppers contain a plant compound known as capsaicin, which is the source of the fiery effects associated with chilies. Capsaicin has a long history of therapeutic application in traditional medicine. 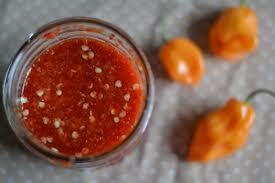 Recent research also suggests that capsaicin may represent a potential treatment for colon cancer. However, the evidence to support the use of capsaicin in colon cancer therapy at present comes exclusively from animal and laboratory research. Capsaicin is also used in traditional medicine to treat a variety of problems, including digestive problems, poor circulation, loss of appetite and arthritis. In the last days, capsaicin has been used in topical creams to calm and give relief for muscle soreness and arthritis. All of this is still under investigation, but a bit of more spicy foods doesn’t hurt anybody. Let’s find out if this can help us, if not, at least we’ve had fun eating spicy and yum food. Chop all ingredients in pieces and mix well. Bring to a boil and continue to keep at a low boil for 3 to 4 hours until thickened and cooked thoroughly, can or freeze or can in jars like jelly. Recommendation: be very careful; remember that you are working with chilies and this might be irritating to your eyes. Don´t touch them during the process. This is a very simple recipe, but all the ingredients mixed together will give that relief you were looking for. If It doesn´t work for constipation, spread it on a bread and make a sandwich; I can assure you it tastes delicious mixed with mayonnaise and the rest of the ingredients you want to add for a perfect meal. Don´t forget to share your comments and let us know if this was helpful to you!